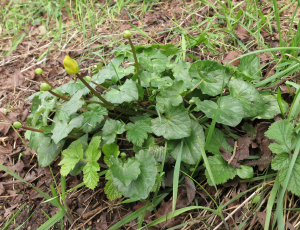 Leaves seem rather large for celandine (about two inches across). Stems rather tall (four inches). None of the flowers yet open. (Not sure if this is because they aren't ready yet or because the light is consistently too low.) But if it isn't a celandine . . . what is it?